Voice your opinion! 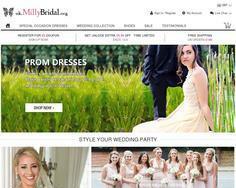 Review Milly Bridal now. I will definitely be ordering from this site again!! I am very tall so its hard for me to find floor length dresses that actually go to the floor! This website let me put in my exact measurements and they made me a custom dress. I figured it wouldnt make it in time or something would be wrong and it wouldnt fit right. Luckily it came and it fit almost perfect!! The material was great and all I had to do was steam it and go. I was so pleased with the dress and I got a lot of compliments. I will definitely be ordering from this site again!! Great dress and perfect size! Worked with MillyBridal for the perfect fit for my bridesmaids. A picture of one of bridesmaid. Custom made, timely delivery, and excellent customer service. I highly recommend this vendor to everyone. Thank you again! This is one the worst stores yo can buy dresses from, they sure will rip you off big time, I will not buy from this Milly bridal again ever ever never never, the quality is the worst. Trust me don't buy from this web site. Isn't it nice to know that you can totally count on a company for what they say they will do? Is Milly Bridal your company? Discover the perfect bridal gowns at uk.millybridal.org - a fantastic online store, from uk wedding dresses, prom dresses and sparkle wedding accessories.